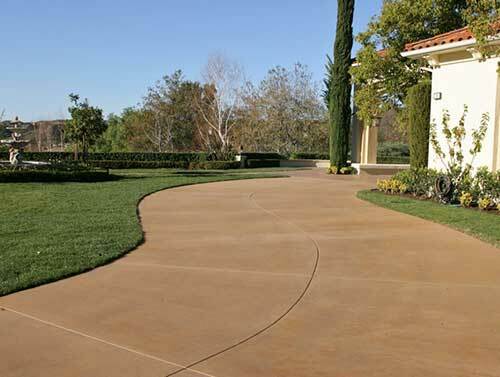 Staining is a simple way to upgrade, enhance and enrich the appearance of many kinds of concrete products. Whether it be a tired old gray concrete slab (patio or driveway) or an existing retaining wall, paved area, or stonework; with concrete and masonry stain it is easy to give a fresh new look to your home. Though the process is simple below are five things to take into consideration before beginning your staining project. First you want to evaluate the condition of the concrete, conditions of use of the area, application conditions and desired appearance. These will determine which type of stain you will use for your project. RCP Block and Brick carries two types of stain: CAM Stain and Silica Shield. While products can be applied indoors and outdoors and are environmentally safe, the different aspects of your project will determine which one best suits your project. CAM Stain (Concrete and Masonry Stain) is a semi-transparent, water based modified acrylic that is easily applied with fewer restrictions than the Silica Shield. CAM Stain is ideal for staining an area that may have been previously sealed. It is not ideal for driveway applications as it does not have as good of a hot tire resistance as the Silica Shield. Silica Shield is a water based, modified silicate stain that provides a highly transparent appearance. Silica Shield penetrate the concrete to make chemical bond with concrete, this is why it is NOT good to use on an area that has been previously sealed. It is recommended for use on driveways and other areas of high traffic due to the fact that is provides a great hot tire resistance than the CAM Stain. If you have any questions, or need help determining which type of stain will work best for your application, please contact an RCP Block & Brick near you and we can help answer your questions! Proper surface preparation is the most important thing to ensuring the successful application of a stain. 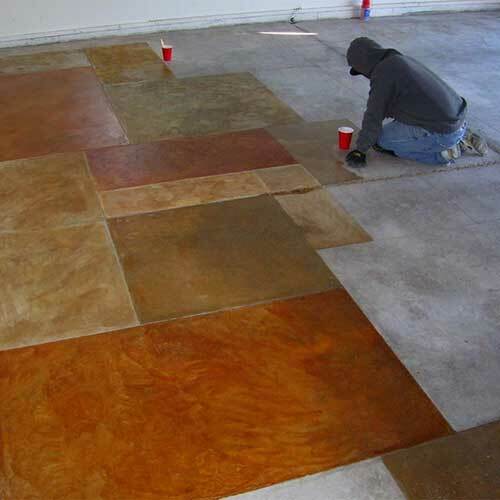 Dirt, oil, grease, bond breaker, sealer, and paints will hinder the preparation and bonding of the stain, therefore these must be removed from the concrete before application of stain. An Etching Cleaner is recommended to open the pores of the concrete and to clean the surface. Dense concrete will require a strong solution while porous concrete will need a diluted solution. Scrub surface with a broom or brush and remove with a solution of baking soda to neutralize the surface. Stain can be applied with a brush, roller, sponge, or sprayer. Practice applying the colors for your desired look on an inconspicuous area or on a cement board. Concrete should be minimum of 7 days old for Silica Shield and 3 days old for CAM Stain, but the longer water has to leave the new concrete the better. Do not apply stains in temperatures above 100 degrees F or below 45 degrees F. Applying in direct sunlight or on hot surfaces can cause rapid curing. Dampening the surface prior to applying stain will help hide brush or roller marks. Allow 24-48 hours for stain to cure before exposing to rain. Routine cleaning and resealing will help extend the life and appearance of stained surfaces. Touch-ups are best done with CAM Stain. If removal of stain is required, stain can be removed after curing with a stripper, grinder, or sand blasting. Using concrete and masonry stain to improve the look of your tired old concrete surfaces really is an easy project that anyone can handle. If you have any questions along the way, just give us a call… remember that we are here to help you get the job done right!